I am always slightly amazed when things I had intended to do actually happen. Normally, it’s just me plodding forwarded through a hailstorm of self-doubt. 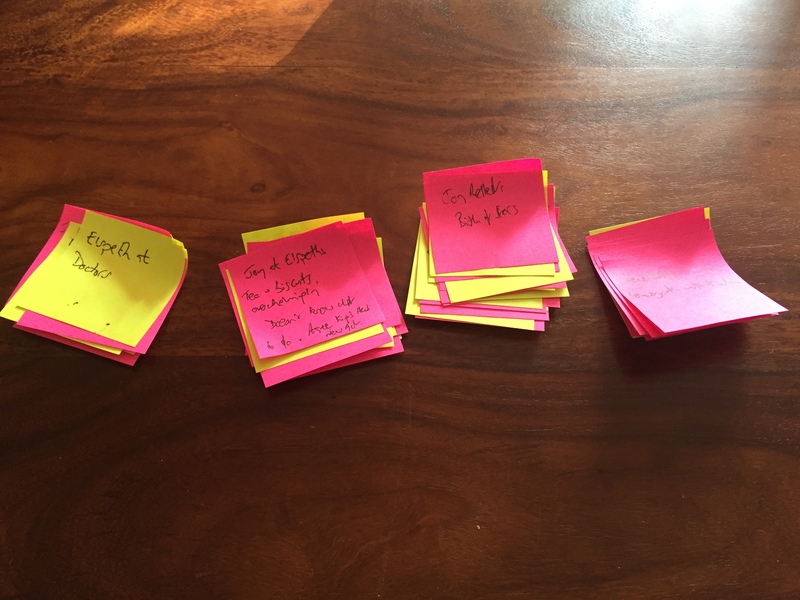 Ten days ago, I set out to put one-line summaries of all the old and new chapters of my novel onto Post-its, so that I could sort out the new structure. Yesterday, I finished – hoorah! It may sound like a simple enough task, but the problem I had faced was that, in a novel of alternating points-of-view, the established character, Elspeth, had eighteen chapters; the new one, Joy, now had forty. There were all sorts of meanderings and shenanigans. The first thing I did was to set the Post-its aside. It was clear that, initially, a temporary format wouldn’t be enough. I needed a reference document where I could note chapter numbers and any amendments, as well as the basic plot line. I created a table on Word, one column for each character. Just seeing the names there, side-by-side, Elspeth and Joy, I felt a real sense of potential. I know a lot more about Joy now and together they complement one another. The story is quite different to what I envisioned when I started writing six years ago. I had intended to leave the discarded character’s (Barry) chapters out of Elspeth’s column. But I realised it would raise questions for me about the original structure when it came to review. I also found it helpful to mark the quarter, half and three-quarter points in the story. Two things immediately became apparent. First, Joy, a comedian, needed an opening chapter setting out clearly who she is. Secondly, there was no obvious point at which she had agreed to work with Elspeth – and she lacked a convincing motivation to do so. Transferring the chapters from columns to Post-its, each character’s point-of-view chapters got a different colour. This made it obvious where there was doubling, or lack of balance. Some nice shortcuts presented themselves, and I was able to drop a chapter I’ve always had a problem with. I read the order of the first-quarter chapters out to my girlfriend, and it was interesting to watch her reaction and get feedback. Overall, I’m pleased. A project to rewrite the novel, that started in January, is on track. I like the new character, she brings energy that was lacking. Onward to the next stage. There are chapters to create, rewrite and edit. Eventually I’ll have a pre-draft draft. One that needs just one more polish to be declared a finished version. Second stage of the twelfth draft done. All the new chapters I had written to introduce the new character have now been revised, to make them even more reflective of that character. Some had already been re-written for writers’ groups. But it now means the forty-two chapters with her in them are up-to-date. Which leads to the next stage. The novel is told from two characters’ points of view, by alternating chapters. By my estimate there are about twenty-one from the established character and now forty-two from the new one. Somehow, they’ve got to fit together. One the reasons for the disparity is that, in writing the new character, I allowed myself to follow hunches and go off-piste, meandering away from the boundaries of the original structure. Very good for creating the freedom for the character to flourish; not so good for putting it all back together again. Which is why, yesterday, I stood in the Rymans opposite Charing Cross Station, looking at their full range of Post-its: heart-shaped, arrows, full traditional squares, little flappy ones, colourful spirals. I picked the pack of small-squares. Four different colours, one for each character and the extra ones for their subplots. 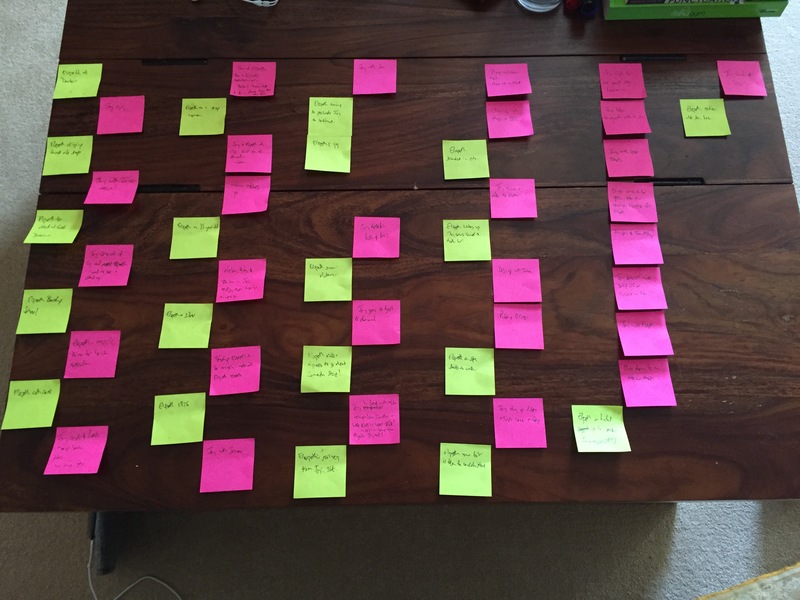 I’ll go back through the chapters, write a brief account of each on a Post-it, then see what it all looks like when I arrange it all on the table. The advantage being that they are easily moved around. I’m looking for a clear structure and perhaps new insights into the ways in which their stories intertwine. I’m pretty sure I’m going to have to let go of some more writing I like.